HarborLAB partnered with the Interdisciplinary Laboratory for Art, Nature, and Dance (iLAND) on Sunday to document, and elicit a creative response to, the restoration of marsh grasses, dune grasses, and other native life to White Island in Marine Park Preserve. Videographer Charles Dennis led the wonderful ‘iLANDing Expedition to White Island” as both guide and artist. For HarborLAB this was an invaluable opportunity to build relationships with artists who care about ecology and might share their skills with the communities we serve. 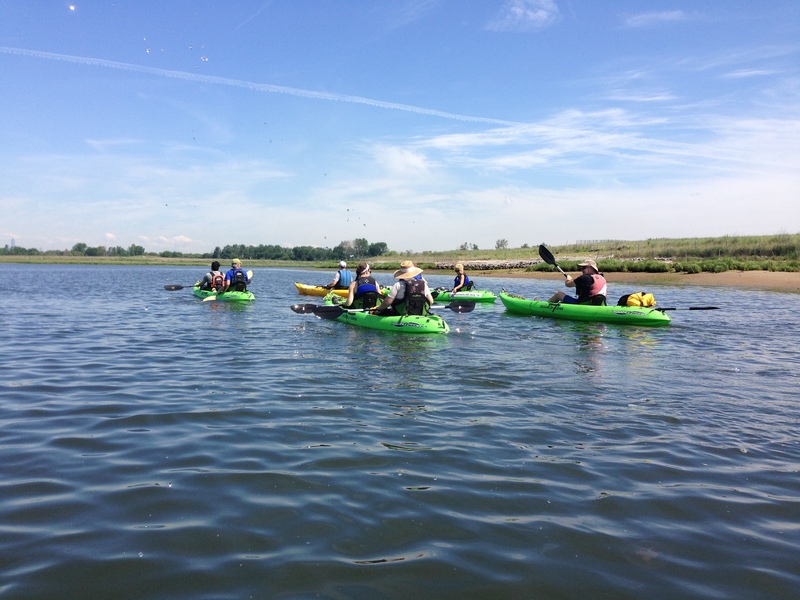 It was also a scouting mission to a new area of the harbor for us, Gerritsen Inlet, where we now plan to bring partner groups for beach cleanups and birding. 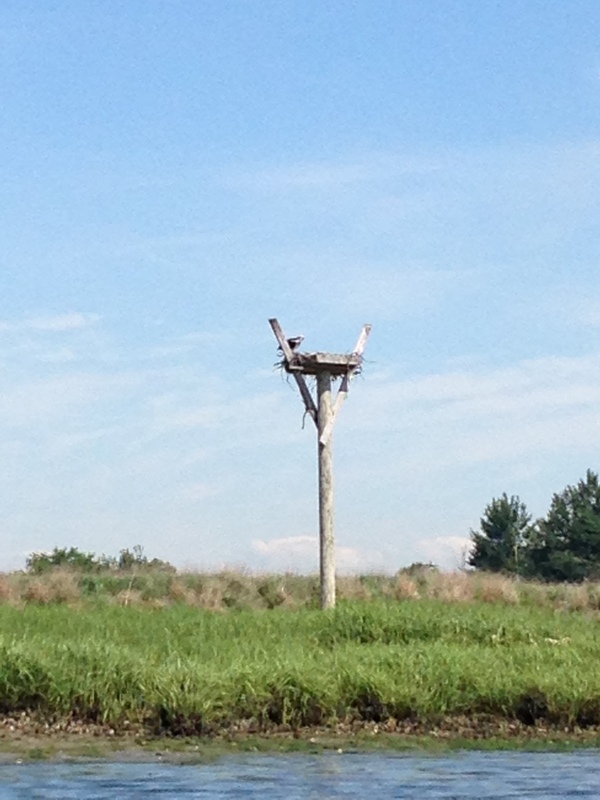 We saw a great egrets, skillfully diving terns, reed-perching red winged blackbirds, an oyster catcher, a mated pair of Canada geese, herring gulls, great black backed gulls, black crested night herons, double crested cormorants, and an osprey atop, and circling, its nest platform. The intertidal zones held marshes of spartina, but we could see clumps of the grass being undercut by erosion from below. Dense stands of invasive phragmites formed a feather-topped fence just a few paces upland from the water. At the foot of the reeds were glinting and colorful assortments of sea glass, complete antique bottles and glassware, and porcelain shards. Of course there were seashells of every kind and scattered bones, bleaching in the sun. White Island itself had various plantings dotting its sands like new hair plugs. As Charles Dennis described the mammoth operation to restore the island’s ecosystem, one could picture an amphibious assault by ecologists like a green D-Day. The inlet itself was alive with horseshoe crabs, eels, other fish, sea weeds, and jellyfish. There was a mysterious pulsing buzz underwater that was almost certainly mechanical, not organic. HarborLAB is grateful to iLAND, NYC Department of Parks and Recreation, and volunteers Gil Lopez (a green roofing instructor and certified permaculture landscape designer), Mairo Notton, and especially Patricia Erickson for making it possible to enjoy this outing, which was coordinated on the HarborLAB end by Erik Baard. Our fearless leader, Charles Dennis. Photo by DD Maucher of MoS Collective (www.moscollective.net). LeAnne Harvey, Community Relations Manager for Human Impacts Institute. Photo by DD Maucher of MoS Collective (www.moscollective.net). Photo by DD Maucher of MoS Collective (www.moscollective.net).